Kiikii Beach Bach is located on the north coast of Rarotonga in the village of Tupapa adjacent to its sister property, the Kiikii Beach House. When viewed from the outside it looks like a typical Kiwi weekend retreat with simple features, however the inside tells a different story with modern furnishings including a spacious cane lounge suite, a 48inch television, a circular dining table with ample room to seat six diners taking center stage and all the necessary appliances and an entertainment suite to make you feel at home. Split off from the lounge is the main toilet and shower and three separate bedrooms, two of the bedrooms have double beds and the third which is also the master bedroom has a queen size bed and its own ensuite shower and toilet. Each bedroom has its own full length wardrobe and mirror and in all belies the space it occupies. The focal point of Kiikii Beach Bach is of course the outside veranda area which consists of a funky white furniture set and a breathtaking view that looks straight out to the Pacific ocean. While Kiikii Beach Bach is located on the ocean front, Rarotonga’s northern coastline is rugged and rocky and ideal for exploring and coastal walks and being out on the reef and lagoon at low tide. At low tide you can also sit in the water to cool yourself off or take a quick dip. Whatever you wish to do while on holiday whether it’s to relax and read a book, get a tan, invite friends over dinner or take part in some of Rarotonga’s many tours and activities, Kiikii Beach Bach is the ideal home base. It is a 3 minute walk to Super Brown store, a 24 hour convenience store which stocks a full range of all types of goods and has an outdoor ATM machine. It is 5 minutes by car to town with all the local shops, cafes, banks and supermarkets and 10 minutes by car to the famous Muri beach. The airport is also 10 minutes away by car. The location of this property on the beachfront is great and it is close to town however unfortunately the property is let down by the maintenance and utilities. The King and a double slat bed are broken which is unacceptable, it was fortunate that our family hadn't joined us as originally intended as it would have been impossible to stay here. The BBQ has to be shared, tiles were broken and crockery cracked. There are much better value properties in Raro and we were very disappointed. Kiikii beach house is spacious, clean, well fitted with all equipment needed in the kitchen. Kiikii beach house is spacious, clean, well fitted with all equipment needed in the kitchen. 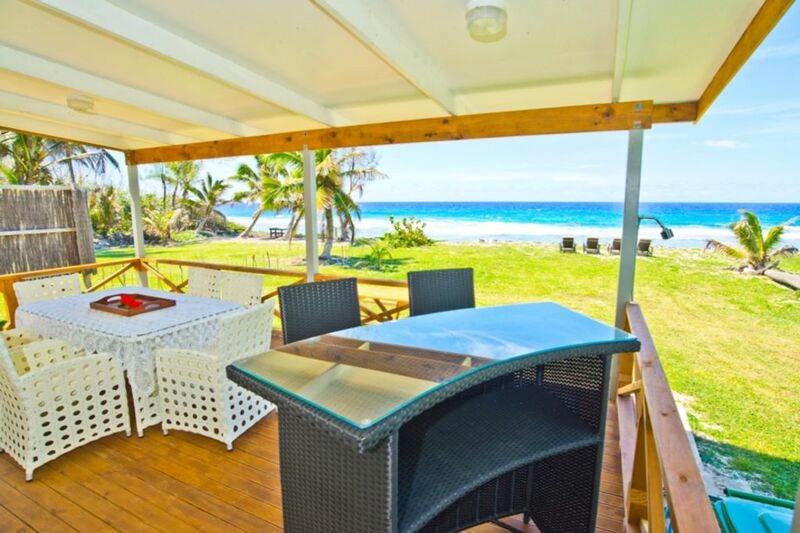 A lovely verandah facing the ocean with furniture to sit, relax and celebrate life. The chickens roam free and it was a delight to watch and feed and see them feed their chicks, delightful. Great spot next to the ocean - awesome view from the deck. Great spot next to the ocean - awesome view from the deck. It's not really a swimming beach but there's plenty of great beaches around the island to swim at anyway. Perfect spot for relaxing, we had a great week here.